The second post in my new blog, Connecting policy to the classroom, shows how improvement cycles can make a major difference to student learning, but only if their steps are specific, never generic. 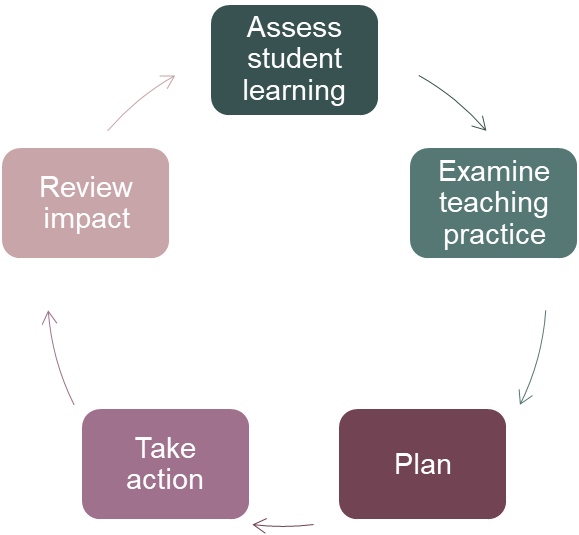 An improvement cycle that shows the steps educators need to take to continuously improve teaching and learning of that curriculum. Put simply, these policies should show everyone what they need to teach students, and the steps they need to take to get better at teaching it. This sounds obvious, but to be true, we always have to be clear and specific about what this means in practice. Regarding the first policy, we have launched a series of papers (written in collaboration with the Johns Hopkins Institute for Education Policy) on curriculum and its links to system improvement. This second blog post is about the second policy: working through a process to enable system leaders to develop and implement an effective improvement cycle. Improvement cycles activate what the world’s leading research says needs to be done for schools to continuously improve. They have driven growth in high-performing systems around the world. But we should also be honest about the fact that improvement cycles are not a panacea; they have failed many, many times. In our work we have found, time and again, that what determines the success or failure of an improvement cycle begins with how specific it is: in other words, how clear are the actions people are supposed to take to improve teaching and learning of the curriculum. Too often, we talk about education strategy and policies for system reform without getting specific about what people should do in schools, and across the system to continuously improve performance. This is a huge mistake. Basic strategy says that once you set a goal, you need to identify what needs to be done to reach the goal and who needs to do it. The research on behavioural and organisational change says that people have to be clear about what they need to do in order to change practice, otherwise it won’t happen. So being specific about what people need to do is not only crucial for an effective improvement cycle, it is an often overlooked element of developing strategic reform. I find it best to think of an improvement cycle as a series of steps that people need to go through to continuously improve teaching and learning. Being specific better guides people through these steps, and agreeing on the detail identifies certain non-negotiables. So, while there is no rigid approach to improvement, there are non-negotiables that, if neglected, mean that the likelihood of improvement is minimal. These non-negotiables usually involve the interaction of the improvement cycle with curriculum– with assessment, standards of achievement, sequence of learning, instructional supports and so on. Review the impact of the new approaches on student learning, and determine implications for the next cycle. All this is may seem pretty straightforward. But impact on teaching and learning only occurs when we are specific about what all this means. This requires reaching agreement on the detail of what needs to happen at each step of the improvement cycle. A process to achieve agreement on the details of each step is best explained by examples of our work with leaders in two systems. In both cases we worked first on systemwide improvement with a group of state and regional/district leaders and then with a group of principal managers (or their equivalents) and school leaders. What should happen in schools at each stage of the improvement cycle to ensure continuous improvement? What should happen at each level of the system to enable these practices in schools? Who does what? This includes defining roles and responsibilities in schools and across the system for the changes identified in question 1 and 2. How will we know? For example, how will a school principal know that teachers are making the required changes for continuous improvement? How will a principal manager know if a principal is making the required changes for continuous improvement, and so on? These questions also form the basis for data, reporting and accountability policies that will be discussed in later blogs. When people first work through these questions, they normally create long lists of things people must do to ensure school improvement. But when you think it through, you realise that asking a principal to do an extra 38 things a week is probably not going to work. So, we have to prioritise, and that’s when it gets interesting. In our first example, the group of system leaders had written a long list of things that the research showed – and their experience highlighted – needed to happen in schools to effectively assess student learning. They really did want to prioritise. As system leaders they knew that if they said everything was important in assessing student learning then they were actually saying that nothing was important in assessing student learning. But it is always difficult to stop talking about all the things that can be beneficial and to focus on the few things that are most important. We talked for over a day on this, revealing problems in policy, practice and inequities across the state. At times things got heated; people took breaks, and resumed discussions. Finally, they decided on a series of steps that required teachers and school leaders to work collaboratively (and with their principal managers) to link specific summative and formative assessments of student learning to the state curriculum in order to identify student learning needs, and then set goals and monitor the impact of teaching practice on student learning. Once the most pressing student learning needs were identified, more steps were developed to support an examination of teaching practice – what teaching in schools looked like in the area of student need. Identifying these specific steps created a deeper understanding of teaching and learning and created a platform for improvement. I don’t pretend this was some theoretical breakthrough in education policy; there was no silver bullet or magical conclusion reached. But for the first time, system leaders across this state agreed about what people should do in schools to properly assess student learning for improvement, and what different people across the system should do to support schools to do this. Another state went through the same process but came to a slightly different conclusion. This state had historically done relatively less work on curriculum reform and was starting at a lower level of performance. They had similar concerns about assessment as the other system, but were particularly concerned to identify specific steps that pushed people to focus on the impact they were having on student learning. They wanted to ensure that the improvement cycle didn’t, for example, lead people to look at standardised assessment results, identify low performance in, say, reading, and then just go and buy another reading program. So, this group of system leaders decided to focus on defining in detail the “Examine teaching practice” stage of their state’s improvement cycle. The goal was to build teachers’ and leaders’ understanding of how to review current practice and determine the most urgent areas for improvement. The system leaders set out their expectations for how schools would review current curricular, pedagogical, and assessment practice in the identified area of student learning need, and draw both on internal and external expertise to identify the most pressing areas for improvement. Again, creating a common understanding of the specific details of continuous improvement allowed system leaders to develop more targeted policies in this and other areas. I believe it’s incredibly valuable for systems to work through this process and for system leaders to work together to determine the specifics of each step in the improvement cycle. Not because improvement all depends on local context – it simply doesn’t – but because the process itself is important. People at different levels of the system coming together to agree on specific steps for continuous improvement creates a dialogue and understanding that in some respects is the basis of system change. Most obviously, it increases ownership of the new approach, but it also changes how the system discusses policy. The impact of this is hard to underestimate. System leaders work incredible hours, are constantly being pulled in different directions, have stakeholders screaming for this and that, and yet are supposed to undertake huge, complex system reform. Agreeing on concrete priority actions in schools and across the system for continuous improvement sets new parameters for policy discussions. It enables tangible ways to discuss the merits of new ideas. It can help swat away the constant noise of endless shiny new initiatives. It also shifts the expectations of policy debate, emphasising the need for the specific and tangible. For example, one system we worked with was going through this process and focussing on how to improve maths results; what schools should be doing to improve instruction and how the system could best support schools. Because system leaders had moved their focus from the generic to the specific, we saw policy discussions shift from broad plans to increase the number of numeracy experts to discussions of how “schools are identifying student learning problems when they teach multiplication and division in Grade 3. We now know schools in this regional area can’t access the right expertise, so what can the system supply to help them?” I’ll say more in a later blog about this example and a process system leaders can work through to examine issues of schools accessing the right expertise. To many people, identifying the specific actions people need to take for continuous improvement can seem like an implementation issue. It is actually a strategic issue, one that is often ignored in education policy. Historically, when systems focus on the detail of what people should actually do, they focus on the research of best practice in schools and classrooms; effective teaching practice and so on. We don’t want to ignore this research – it is very important. But a fundamental difference with the strategic approach I am laying out here is that it focuses on the specific actions people need to take to continually improve what they do so they can reach best practice. The specificity is in what people need to do on an improvement journey rather than what they should be doing at the end of the journey. This may seem like a small difference, but it leads to major policy changes. Later blogs will discuss these policies and how being specific on the actions for continuous improvement allows us to prioritise and sequence policy changes in a way that amounts to a new strategic approach. We’ll also publish case studies from Ontario and British Columbia in Canada, and from Singapore – three systems that have gone a long way to getting this approach right – to illustrate different options. Next week Learning First publishes two further papers in our curriculum series, written in collaboration with the Johns Hopkins Institute for Education Policy. The first paper, Creating curriculum literate teachers, will examine shortcomings of American teacher preparation providers in developing curriculum literate teachers and make recommendations for reform that are applicable in numerous countries. The second paper, Combining curriculum and best practice teacher professional learning, will show how the improvement cycle and quality curriculum can be mutually reinforcing and help drive improvements in teaching and learning across systems. We hope you enjoy them.